We raise our pups with our kids, family and friends as though they are part of our family. They are well rounded, socialized pups by the time they are ready for your home at 8 weeks of age. Our puppies have lots of room to romp and play on our beautiful 54 acre bush property! We are located on the outside of a little town called Wingham, Ontario located about 1 1/2 hour from London, or 2 hours from Toronto. 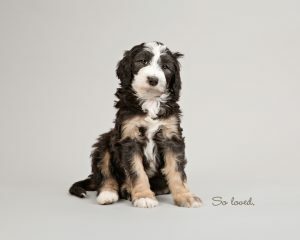 We specialized in breeding the designer Sheepadoodle in a variety of sizes. We chose this breed because of their hypoallergenic, low to non shedding coat and their wonderful personalities. Our puppies are bred to be friendly, cute and smart and kind-hearted. 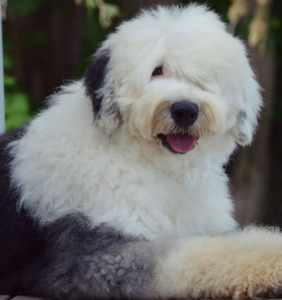 The Old English Sheepdog is everyone’s friend. They are loyal and devoted to their owners. They are very smart and have a beautiful coat pattern. Mixed with the poodle the Sheepadoodle has a beautiful soft coat, can be bred down to smaller sizes, are hypoallergic, playful ~ sometimes comical and goofy, and just a nice family companion. The poodle has been known for being a ladies lap dog, giving it the quiet calm family attribute we love. It also can be remembered for its tricks in the circus. This makes it an easy dog to train as a family pet. and natural methods. AI is the short form of Artificial Insemination for short. This special technique that is not new to the breeding world in other animals and is commonly used in breeding of cows, horses, pigs and also dogs. 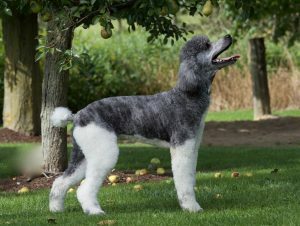 We use a Mini Poodle that we have carefully selected for a quieter, pleasant personality and preferred coat pattern. Our female dogs are serviced by proven, worldwide recommended breeding dogs. We are pleased that we can provide a beautiful doodle in a smaller size to you. We care about the health of our puppies. We have our vet come right to our home to check over and approve each pup before it is offered for sale. The puppies will have their first set of vaccination, be de-wormed and have their own individual health cards. We offer a 1 yr all inclusive genetic health guarantee on any life threatening genetic illnesses on our pups. This includes hips, heart and eyes. It can be upgraded to a 2 yr health guarantee with enrolment in our NuVet Vitamin program. 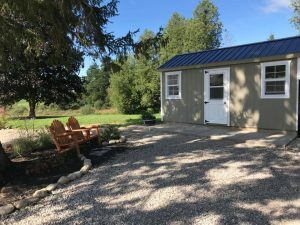 Our home – Fall 2017 we moved from our acreage in Cranbrook, Ontario to a 54 acre bush paradise outside of Wingham, Ontario. 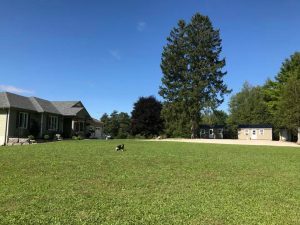 We are so thankful to have this peaceful country property to call home for our family and dogs. There is so much room to run and play and enjoy the beautiful nature! Our pups and kids have lots of love to give and enjoy the companionship of each other. Our Puppy Nursery – The puppies are raised in an indoor/outdoor heated or Air Conditioned cottage like setting. We have soft music on in the nursery for a quiet, pleasant environment. We also have video surveillance to be able to watch the pups from wherever I am at any given time. We enjoy spending time with the pups whether in the nursery, in our home or outside playing around in the grass or on the trails. The adult dogs have a Doggy cottage similar to the Nursery but larger. Their have a large fenced in play area and also have indoor/outdoor access. If you are interested in a puppy from us you may fill out our puppy application. We will get back to you as soon as possible. Expect about 5 business days for a reply as we are busy with our dogs, puppies and family. Once we have received your puppy application we will take deposits for our waiting list. To reserve a puppy on our waiting list a non refundable deposit of $500 is required. You can pick your future puppy from your desired size in the order that your deposit came. 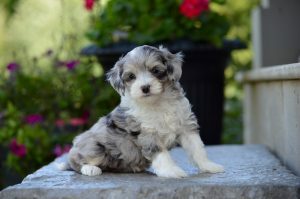 Your puppy will be ready to go home once it reaches 8 weeks old and has passed it’s vet inspection to verify good health. 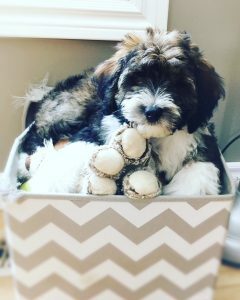 We thoroughly enjoy raising well bred, healthy puppies with our family and are happy to connect you with your future fluffy family member! God Bless Your Family as He has Ours!